We've been listening to a lot of Martha & the Vendellas in this major heat wave. When the weather is this warm, the last thing we want to do is work. Despite our reluctant bones, we still managed to gather up enough energy to compile a list of literature’s laziest characters. Now we need to take a nap. Hypnos is the god of sleep. He spends all his time drowsing in a dark cave in the underworld or putting people into a deep slumber. You know you have lethargy down to an art when you only wake up to put other people to sleep. The gods are usually annoyed when they wake up from one of his sleeps, which indicates to us that his brand of sleep must be pretty magical. We would love to try it sometime. The Lotus-eaters are gifted at giving people the munchies. When they offer sailors lotus, they no longer wish to go home. All they want to do is lie on the island and eat all day. Odysseus has to leave them behind on the island, but honestly, we can think of worse fates. Mary Musgrove and Ferris Bueller have mastered the same ability: faking sick to get out of unpleasant things. Unlike Ferris Bueller, Mary doesn't complain about illness to go on grand adventures. Instead of wrecking cars, she just ruins people’s plans. She says she doesn't feel well so Anne will do the work for her or someone will take her home. What does she do with this free time? She basically lies around and does nothing. We think dancing in a parade or having lunch at a fancy restaurant would be a better use of her time. Bartleby takes laziness to a new level. He essentially dies from laziness. His laziness begins in the standard way—he simply doesn’t want to do his job. While most people just shut up and do their work (despite how much they dislike it), he says, “I would prefer not to.” Then he doesn’t do it. Eventually, he refuses to leave the office, and then he won’t eat. This is ultimately what leads to his demise. We may be tired, but we are always ready to eat a pizza. Clearly he didn’t have the right chefs in his life. Maybe he should have taken a trip to visit the Lotus-eaters. 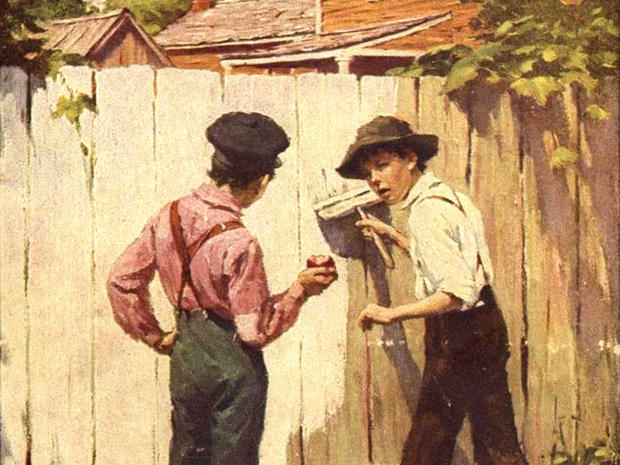 Okay, we have to hand it to Tom Sawyer. He's not only lazy, but he profits from it. When he is told to whitewash a fence (the old-school punishment for skipping school), he gets his friends to do it for him by making it look like the most fun activity ever. Not only does he pawn off his punishment, but he convinces them to give him their stuff to do it. We are pretty sure this trick would not work in a post-television world.